The truth is, to the authorities, Grenfell Tower tenants didn’t really matter. The tower is in a deprived pocket of one of the richest boroughs in the country. It was refurbished last year at a cost of £8.6 million, but from the start tenants’ safety was ignored and the original contractor was dropped for a cheaper option. Work was carried out in such a shoddy way some tenants refused to let workmen into their homes. At no point did the TMO consider fitting a sprinkler system as part of the refurb. Tenants also complained that the contractors piled rubbish in communal corridors, blocking fire exits. Planning documents for the refurbishment argued that cladding should be used because: “Due to its height the tower is visible from the adjacent Avondale Conservation Area to the south and the Ladbroke Conservation Area to the east.” It sits in one of the richest areas in London, two miles from a new 21 storey tower where one bedroom flats are at least £1m. So it was important that Grenfell Tower looked right. The document went on: “The changes to the existing tower will improve its appearance especially when viewed from the surrounding area.” 3 The decision was made to clad the tower with cheap material. The TMO found a contractor to supply cladding which was £2 cheaper per square metre than the alternative fireproof material. Just £4750 more would have saved lives. But the material they chose was so flammable that the fire, which started in a flat in the early hours of the morning and which firefighters thought they’d contained, had in fact spread to the cladding which quickly engulfed the whole block, turning it into a raging inferno in less than an hour. It was so ferocious it was still burning well into the afternoon. In the coming months and years, as inquiries get underway, the cladding will undoubtedly be scrutinised. It is banned in Germany and not used in the USA on high rises. There seems to be some confusion at present as to whether it is banned here or not. And this is very telling, given the repeated cuts to regulation over the years. It’s been the policy of successive governments from Blair on to reduce regulation as a way of encouraging business growth. By the time of the Localism Act of 2011, introduced by Eric Pickles, the state had got rid of independent monitoring of local government, and over 2,400 regulations have been scrapped through the Red Tape Challenge which is estimated to have saved house builders around £100m. 4 In social housing this has meant a lack of monitoring on everything from space standards to fire regs. The latter used to be reviewed every couple of years to keep up with changes in technology and building materials, but they haven’t been reviewed for over a decade. It has been left to the survivors themselves and the wider community to organise relief. It was young Muslims observing Ramadan who woke their neighbours when the fire broke out, and undoubtedly saved many lives. Within hours the wider community had sorted emergency clothing, food etc (so much so that volunteers eventually had to ask it to stop) and were joined by the Red Cross, local Mosques and churches. They set up a committee to put forward immediate demands and took these to Downing St. They organised in their hundreds and held mass meetings, electing delegates, organising demonstrations. The community has shown itself to be well organised, efficient, extremely compassionate and truly democratic. Everything the capitalist state isn’t. 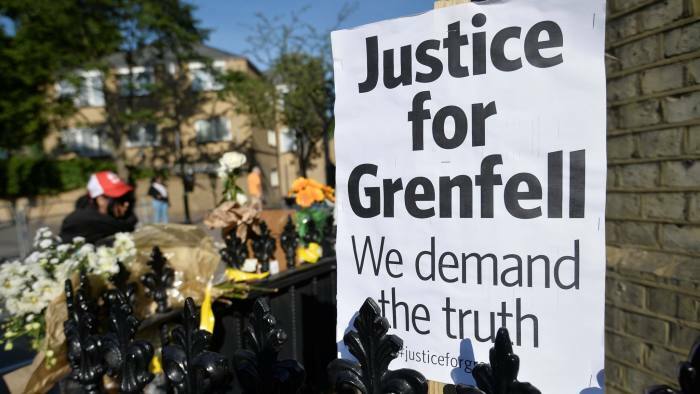 The tenants of Grenfell will have an uphill struggle to get justice; they’ll suddenly find all that ‘red tape’ that was lacking for them will be put in place to protect those in power. They’ll have to wade through a complex chain of who knew what and which contractor was in charge when, and who they subcontracted to. Trying to find who is accountable amongst the multiple contractors, building teams, privatised services and reduced council monitoring won’t be easy. And they’ll have to do it with the help of volunteer legal experts, unless they can get legal aid, another thing snatched away over the years. And no doubt along the way they’ll have to listen to politicians who are suddenly able to find their humanity for the cameras, even though the system they preside over is clearly inhumane. The charred remains of the tower stands as a monument to a failed system and its cheerleaders. It should shame them all. Thanks for such an informative article on Grenfell disaster. The attached link to the Grenfell Action Group was also very enlightening. I was really impressed by the quality and range of posts, particularly the class conscious attitudes. Does anyone know if comrades are involved in the Grenfell Action Group? Im training to be a firefighter in Australia and my Dad is currently a firefighter and union delegate. If anyone has further info on Grenfell please comment. Otherwise ill keep an eye out for further libcom updates. Solidarity. justanotherwaiter, Some of the other 'Related' links above might get updated as things develop. Did you pick up on the Australia connection I mentioned there?